With a sense of honour and enthusiasm, I offer myself to the Livery for election at Common Hall to be held at Guildhall on Monday, 24 June, at 12 noon. My colleagues on the Court of Aldermen support my nomination as a candidate for the ancient office of Sheriff of the City London for 2019/20. If a poll is demanded, I would like to ask for your support by voting in my favour at the ballot on Monday, 8 July 2019, also at Guildhall. I was born in the USA, the eldest in a family of six children. As my father was an engineer in the then-peripatetic aerospace industry, I attended some 18 educational establishments in four countries culminating with a ‘liberal arts’ BA from Harvard University, fourth-year studies in mathematics, engineering, and computer science at Trinity College Dublin, and a PhD from the London School of Economics where I was also a Visiting Professor. During my tertiary education I undertook scientific research, principally in aerospace and the then new field of geographic information systems. Working out of Switzerland from 1979-1984, my biggest technical claim to fame might be the first commercial digital maps of the world in MundoCart and Geodat. I entered the City of London in 1984 ahead of Big Bang, becoming an accountancy-firm partner in 1987 with BDO Binder Hamlyn, and in 1995 a Grade 3 Director of Ministry of Defence research, at the time 40% of all UK government research. During a mergers & acquisitions spell in merchant banking with Deutsche Morgan Grenfell, I co-founded Z/Yen, the City of London’s leading think-tank where I work, to promote societal advance through better finance and technology. Along the way I gained professional qualifications in accountancy, securities & investment, and computing. 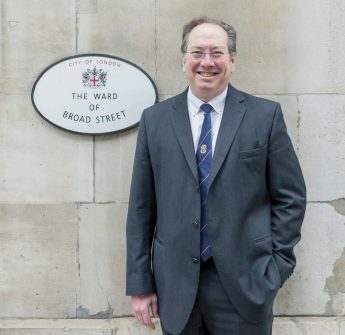 I have been passionate about the City since 1987 when I discovered my vote as an accountancy-firm partner, then Chairman, now President, of Broad Street Ward Club, a Trustee of the Lord Mayor’s Appeal, the Lord Mayor’s Show, and the Lord Mayor’s 800th Anniversary Awards Trust. You may know me as the proud Alderman for Broad Street since 2013. In addition I’m a Fellow of Goodenough College, Trustee of Christ’s Hospital and Morden College, and Council Member for City & Guilds. I am passionate about the contributions of the livery as the Immediate Past Master of the Worshipful Company of World Traders, Craft-Owning Freeman of the Watermen & Lightermen, Honorary Freeman of the Worshipful Companies of Furniture Makers, Water Conservators, and Marketors, and a member of the City Livery Club. My wife, Elisabeth, is from Bavaria. We married in 1996 and have two daughters together, Xenia (21) and Maxine (18), along with my son, Nicholas (29). Elisabeth trained in hotel management. After working in Germany and London, she became a personal assistant to the managing partner of a large accountancy firm. Setting up on her own, for over 20 years she ran a boat charter and restoration business for our Thames sailing barge, Lady Daphne. She continues to work at her events company, Nymph Limited, and is also director of a property management company. 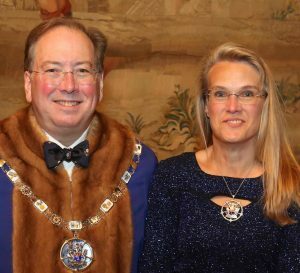 Elisabeth is a Liveryman of the Worshipful Company of Masons and a Liveryman Honoris Causa of the Worshipful Company of World Traders. As for understanding the City, my firm, Z/Yen, has done quite a bit of cutting-edge development from smart ledgers (aka blockchain technology) in 1995, to electronics, Long Finance & the London Accord, and the Global Financial Centres & Global Green Finance indices. Our clients have included virtually all major investment banks, as well as many exchanges, insurers, fund managers, regulators, and financial information providers; along with numerous governments and technology companies. I am a non-executive director of the United Kingdom Accreditation Service, overseeing laboratories and standards, and two AIM-listed firms. I have written numerous academic and professional papers, but am proudest of my third book, co-written with Ian Harris, “The Price of Fish: A New Approach to Wicked Economics and Better Decisions”, which won the 2012 Independent Publisher Book Awards Finance, Investment & Economics Gold Prize. I was designated a Gentiluomo of the Associazione Cavalieri di San Silvestro in 2011, won a 1996 UK Foresight Challenge award for the Financial Laboratory, a 2003 UK Smart Award for prediction software, and was British Computer Society Director of the Year for 2004. My biggest honour was the Mercers’ School Memorial Professor of Commerce chair (2005-2009) at Gresham College, founding home of the Royal Society, where I remain Emeritus Professor and Trustee. My wider interests include skiing, woodcarving, dicing with bagpipes, racing sailboats, and dabbling in German, Italian, and French, but even worse Mandarin. I retain deep links with the sailing barge community and the venerable Thames Match (1863). Change is a City constant. 2019 and 2020 are no different (sic). With four nationalities, UK, Ireland, Italy, and USA, I am ever more conscious of changes round the world. A proud and permanent resident of London since 1984, I want to work to continue to keep the City pre-eminent as the world’s leading professional, business, technical, and financial services centre. For me the three C’s are Commerce, the place where people create prosperity, Community, a cultural place where people work to enrich their environment, and Charity, where people champion diversity, openness, fairness, and opportunity. If elected I will do my utmost to uphold the noble traditions of the Shrieval office. It would be a privilege to use my experience to support the Lord Mayor’s and City of London Corporation’s programmes promoting the City and the UK in all its aspects. on behalf of Professor Michael Mainelli, Z/Yen Group Limited, 41 Lothbury, London EC2R 7HG. Form of address, Mr, Ms, Mrs, Dr, Prof, Col, etc.